Alison McGillivray studied modern cello at the RSAMD (now Royal Conservatoire of Scotland) with William Conway. She became hooked by Early Music while studying with Jennifer Ward Clark in London – her love of the viola da gamba stems from accompanying Robert Spencer’s Early English Song Class at the Royal Academy of Music. 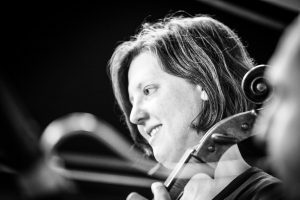 Alison played in London for many years as principal cellist and soloist with the Academy of Ancient Music and the English Consort. skills to explore how the way we move can influence the music we make.